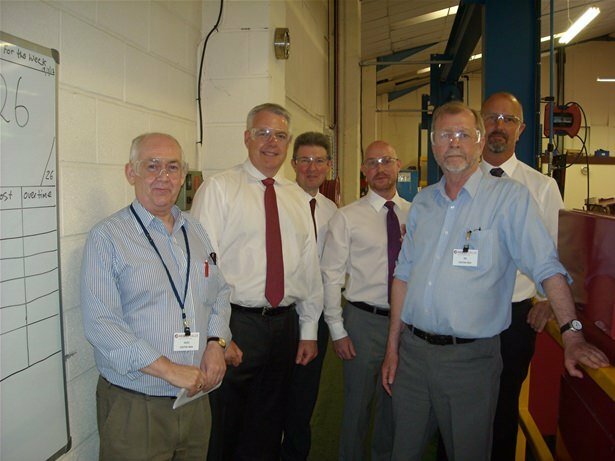 Carwyn Jones visited Hobbs Valve with local MP Wayne David and Caerphilly AM Jeff Cuthbert. Mr Jones met with Rhys Jones, the Managing Director, and Alun Hobbs, the Chairman of the company. The visitors held a discussion about the company, its development and its future. Wayne David said after the visit, “Carwyn was most impressed with the company. Hobbs Valve is a real success story. It exports throughout the world and is pointing the way forward for the whole of the Welsh industry. “Carwyn, Jeff and I toured their factory and saw at first-hand how the company is strategically developing its approach towards making the company even more successful. Carwyn was extremely impressed with the visit and on behalf of the Welsh Government, promised to continue to support the company’s development”. Photo from left to right, Wayne David, Carwyn Jones, Cllr Huw Davies, Managing Director Rhys Jones, Jeff Cuthbert and Chairman of Hobbs Valve, Alun Hobbs.